So, you’ve got a camper trailer and it comes with everything you need for a kitchen setup. You don’t need to cook on the campfire, right? Wrong. Why? Because campfire cooking is fun! Having a camping stove and other implements can make the job easier, but cooking over the fire is a part of the authentic camping experience. And fun aside; there’s tons of delicious meals and treats that you can’t make without a campfire. If you want to cook some serious meals over the campfire, cast iron cookware is essential. 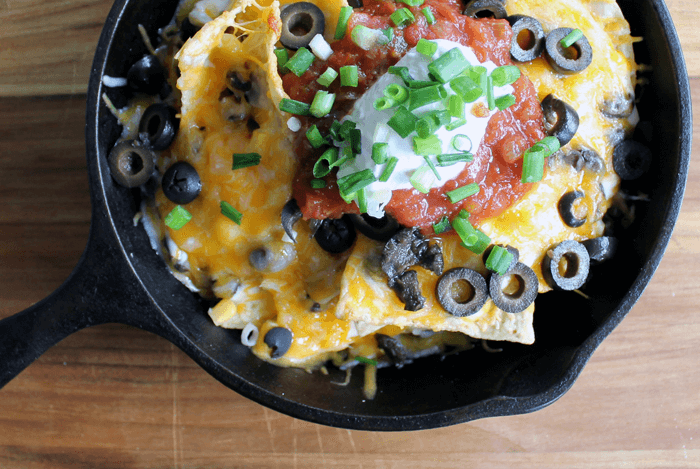 With a simple cast iron pan and a Dutch oven, you can open up all sorts of possibilities. If you are going to cook with your pan right in the fire, you need to know how to build a fire that is going to suit. Having a larger fire can be advantageous, you can set aside one section for cooking, and leave the rest to continue to burn and produce fresh coals. You’ll also need to find a few rocks that are flat to let you sit your pan above the coals. Just make sure they’re not rounded rocks from a river that could have water inside,as these can explode when exposed to heat. With this simple setup, you have a great way to make some awesome crowd pleasers like campfire nachos and baked spaghetti and meatball. Using your cast iron Dutch oven is even easier. Just pack it in, sit it in the fire with some coals on top and let it be. Some of our favourite options are campfire lasagna and chili campfire bake. Aside from your Dutch oven and skillet, you just need to remember to pack some long-handled utensils and hand protection. Anyone who has spent time around a campfire as a child will have had roasted marshmallows on a stick. There is a simple joy in cooking your own treats directly on the flame, and it is a camping activity that kids will love. But there are a number of different ‘on-a-stick’ options that will allow you to step your campfire cooking up to the next level. 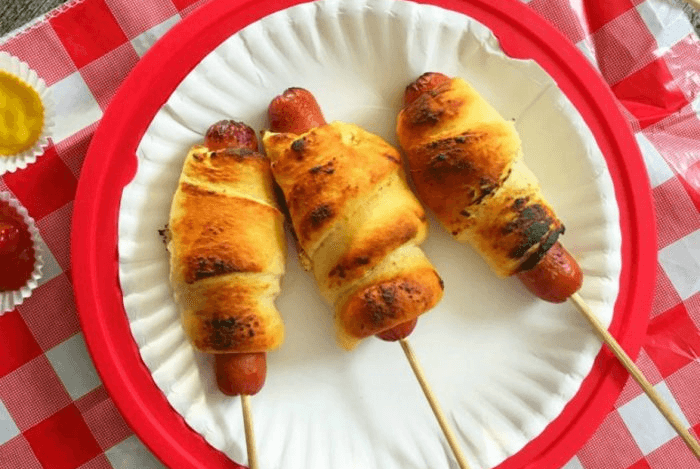 You have sweet treats like campfire cinnamon roll-ups and then savoury options like campfire hotdogs and the damper on a stick. When breakfast rolls around, you could even do campfire bacon on stainless steel skewers. If you don’t fancy investing in cast iron cookware, try cooking with tin foil instead. 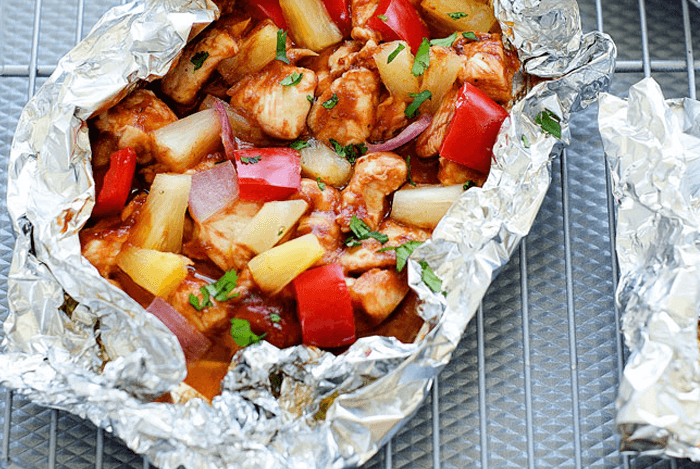 Tin foil package recipes are like the campfire version of the casserole – anything can go in them from hamburger and potatoes to chili cheese fries to BBQ chicken. This is a way of cooking that the kids will love. You have a wide variety of different foods that you can cook using these foil packs, and the kids will enjoy filling the foil up and wrapping the packs to put them on the fire. It is also a style of cooking that really packs a flavour punch. The foil traps in all the juices which boil and mix together. Just be sure to be careful when you rip it open for the first time! Check out a full guide on how to put your foil packet dinner together. 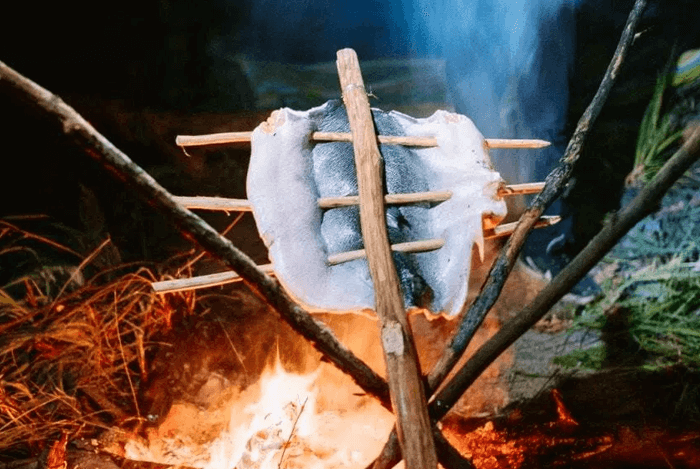 Tin foil is also a great tool for making delicious campfire bread. The campfire Philly cheesesteak offers a new take the classic USA favourite. All of that melted cheese and meat can make for a delicious experience as you tear the sandwich apart piece by piece. 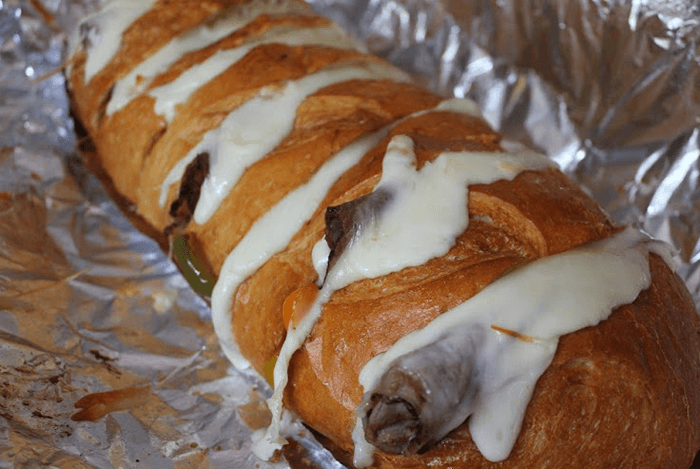 But you don’t even have to go with the Philly cheesesteak recipe. You could make your own custom campfire sandwiches. You could even use the foil to make things like hot ham and cheese on the campfire and campfire breakfast burritos. What could be easier than something you can just stick right on the coals? You get that wonderful chargrilled flavour. The best way to find ‘straight-on-the-coal food is to work with foods that have a natural protective layer, are going to go well with that smoky, charred flavour. 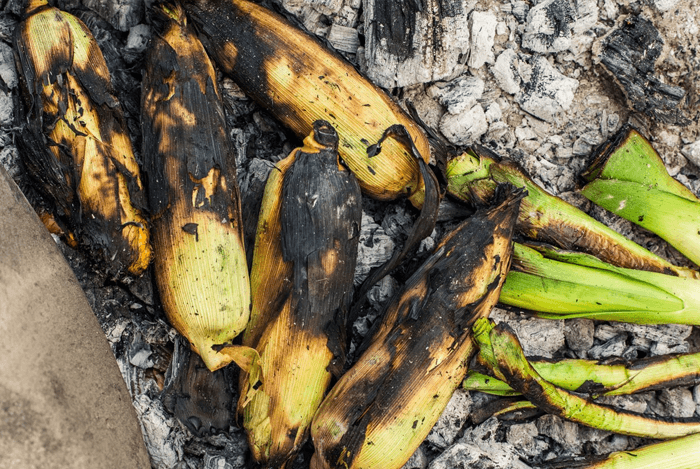 Fire roasted corn is easy and it tastes great. You can also cook just about any cut of meat right on the fire. Along with that, you could try things like coal roasted butternut squash or peppers that are roast on the campfire. 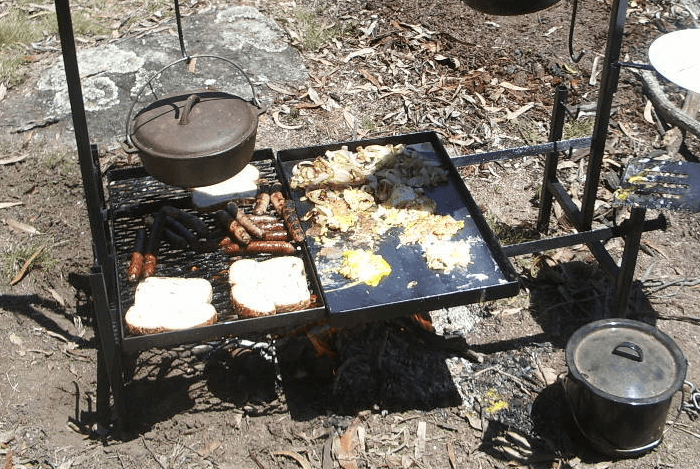 Outdoor cooking is an Australian summertime ritual and with a bit of planning you can take the tradition with you on your camping holidays as well. It takes a bit of special equipment – either a grill stacked up on logs or a fully standing cast iron kit – but either option will turn your campfire into a fully-function flame grilling ‘barbie’. This is an awesome option for a simple campfire dinner. Adults can all sit around the fire as you turn sausages and burgers and the kids can keep running around with a bit of bread and sauce. If you’re a camper there is a good chance you’re also a fisher. And if you are both then there is a very good chance that you do a bit of fishing on your camping holidays. While your camper trailer kitchen is a fine option when cooking fish, there is nothing quite as satisfying as cooking the fish you pulled out of the water yourself on an open flame. You can do this quite easily in your cast iron skillet or on your grill, but if you’re going to do it, why not go all out? Check out some of these stick roasting methods. They give your fish a delicious smokey flavour and is definitely worth trying at least once in your life. 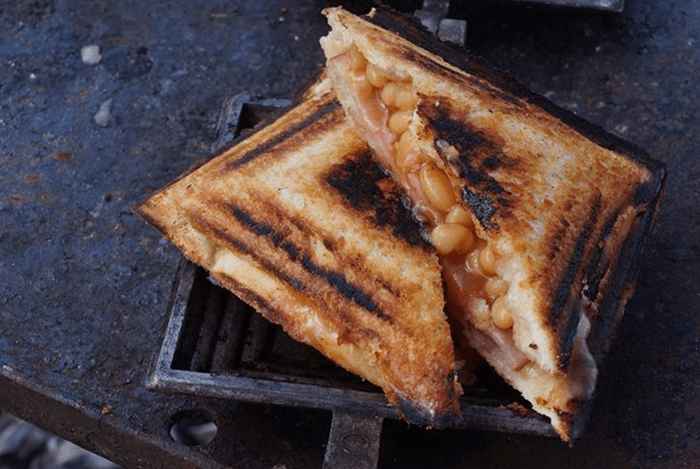 Anyone that has had a jaffle cooked on the open flames in a traditional jaffle-iron will know this is the only breakfast anyone needs when camping. Once you’ve tried one of these creations (known as ‘mountain pies’ in the US), you’ll never look at one of those electric countertop jaffle makers the same way again. Making a great jaffle is simple. You put the bread and ingredients in the jaffle iron, set it in the fire, and when you pull it out, you have a tasty hot sandwich. Here are a few great jaffle recipe options to get you started, but really the beauty of the jaffle is that it is something you can custom make to your own tastes. So, make your own creations! S’mores are an American campfire classic that are a guaranteed crowd please with the younger ones. The standard S’more is a digestive biscuit with chocolate and marshmallow in the middle. 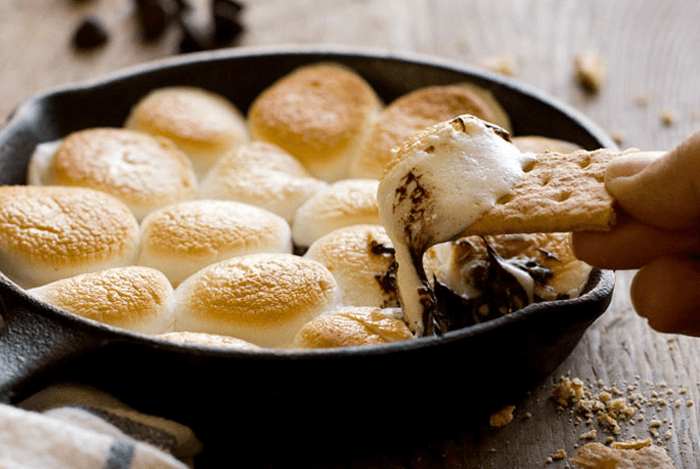 This makes a wonderful treat, but to really get decadent break out your cast iron skillet to make a S’mores dip. It’s delicious and will definitely be a camping highlight for anyone under the age of ten (and let’s be honest everyone else as well). A flaming burrito is a delicious meal that offers a bit of entertainment value on the side. Kids will love the spectacle of watching the burrito go up in flames, and it produces a hot, toasty burrito that is loaded with melted cheese. Is it really necessary to light the burrito on fire? Probably not, but it sure is fun! All you need is the burrito wraps, your favourite burrito fillings, some tin foil and a wax milk carton. By the time the carton burns down, your burrito will be done. It makes for a nice easy meal on the campground, and it can add a little flash to the cooking routine. Nobody ever said you have to do all of the prep work at the campsite. If you want to expand your options and get into some more gourmet options, you can prepare foods and store them in ziplock bags before you go. Just make the food, bag it up, freeze it, and then put it in the cooler or the refrigerator in your camper before you hit the road. By taking the time to prepare before you go, you can open up a wide range of possibilities. You could cook soups and stews, pasta, sandwiches and sweets. You can even prepare some nice breakfast food for you and the family. With some premade pancake batter or some premade omelettes, you can pull out the cast iron pan and make a hearty breakfast right on the fire.